Situated in the Gulf of Thailand, the beautiful island of Koh Samui it is now one of the most popular tourist destinations in the country, attracting travelers from all over the world seeking a tropical beach vacation. (FYI: If you want to travel to Thailand affordably, Great Value Vacations has vacation packages that include airfare/hotel for $1,500). More than 1.5 million tourists visit the island each year to enjoy the kind of tropical coastline and beaches you find featured in ads. With a small number of accommodations available ranging from modest boutique hotels to higher 5 star properties, this is the perfect base for a relaxing beach vacation. It offers isolation while being close to the busier hub of Chaweng (just a 20 minute ride in a taxi or songthaew … red pick-up trucks that haul passengers in the back). The Big Buddha is also close-by, and the beautiful private Samui airport is just 5 minutes away! The Tongsai Bay is located on Koh Samui and provides 5-star accommodation as well as free Wi-Fi. There is also a gym with a swimming pool. Located within the scenic countryside of Bo Phut, Baywater Resort Samui provides comfortable accommodation and a wide range of facilities, such as a gift shop and a library. It is conveniently close to Samui International Airport, which is a 10-minute drive away. Set within the scenic parkland of Bo Phut, Kaya Mani Thai Villa Resort Samui offers comfortable accommodation and a wide range of facilities, such as free Wi-Fi and a laundry service. It is also a short car ride from Chaweng Beach and Wat Phra Yai. Chaweng beach is argued to be the best in Koh Samui, and with many luxury boutique hotels, this is without a doubt the most popular part of the island for tourists. Located in the north east, just south of Choeng Mon, this is where most of the islanders reside. Koh Samui’s busiest and biggest town has sprung up around one of the island’s best beaches. The town offers more options for accommodation than anywhere else on the island, as well as restaurants and bars which cater to every taste. The town comes alive at night, and party goers will find the nightlife here to be ahead of anywhere else on Samui in terms of choice. Be sure to find the famous Soi Green Mango Strip which is the center of the nightlife scene. Chaweng’s single most popular bar is Tropical Murphy’s Irish pub. During the day, enjoy the vast 7 kilometer stretch of beach to recover from the previous night’s activities in town. Tradewinds Cottages is located on Koh Samui and offers 3.5-star accommodation in addition to free Wi-Fi. The resort is situated on Chaweng Beach. Chaweng Regent Beach Resort is situated on Koh Samui and offers 4-star accommodation as well as a rooftop terrace and a Jacuzzi. There is also a fitness centre with yoga classes and a swimming pool. Elegant and cosy, Amari Koh Samui is located in Chaweng and provides a swimming pool. It is situated a 10-minute drive from Samui International Airport and an airport shuttle is available for guests. 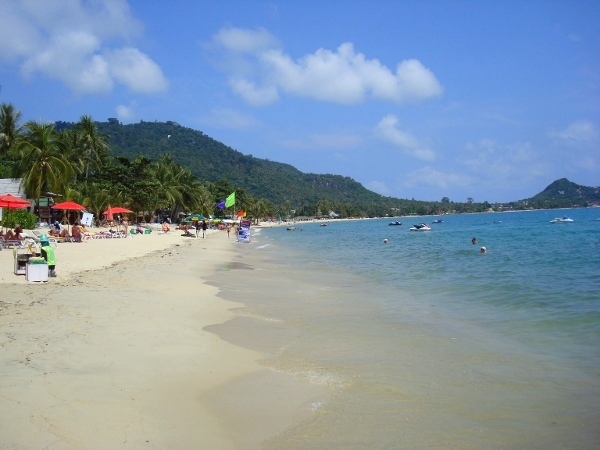 The most popular beach in Koh Samui. Heading further south of Chaweng by about half an hour, you will arrive at my favorite part of the island; the beach and village of Lamai. While a quaint town, this is Samui’s second-largest resort area after Chaweng, so provides all the amenities one would expect from a tropical vacation. There is plenty of accommodation available to suit every budget as well as a variety of dining options, food carts, bars, shopping, convenience stores and more. Though let’s not forget about the beach! A beautiful long stretch of beach absolutely perfect for kicking back and relaxing or simply enjoying a quiet swim, Lamai is out of the way, making it a perfect destination for those looking for a quieter, more peaceful vacation. Though everything you could possibly need is just steps from the beach. Lamai is easily reached from the busier parts of the island – we were surprised by the ease and affordable choices of transportation always available to take you anywhere you wanted to go. Equally as surprising were how reliable your taxi or songthaew drivers were. If you ask them to return and pick you up at a specific time, they’ll always be there as requested! Weekender Resort is located on Koh Samui, and provides 4-star accommodation as well as an infinity pool. It offers a Jacuzzi, a sauna and free Wi-Fi access. Pavilion Samui Villas and Resort is located on Koh Samui and offers 4-star accommodation in addition to free Wi-Fi and a rooftop terrace. There is also a gym with a swimming pool. Boasting unique views of Lamai Beach, Thai House Beach Resort is located in a popular part of Maret and provides free Wi-Fi, an outdoor pool and a Jacuzzi. It offers 3-star accommodation and views of the garden. The perfect destination for those looking for a quieter, more peaceful vacation. With soft white powdery sand and crystal-clear shallow waters, this beach is absolutely beautiful and unspoiled. Lined with a couple of smaller boutique hotels and a modest beach bar restaurant, it really is a small hidden gem on the island and not one widely known by most visitors. Soft white powdery sand and crystal-clear shallow waters. 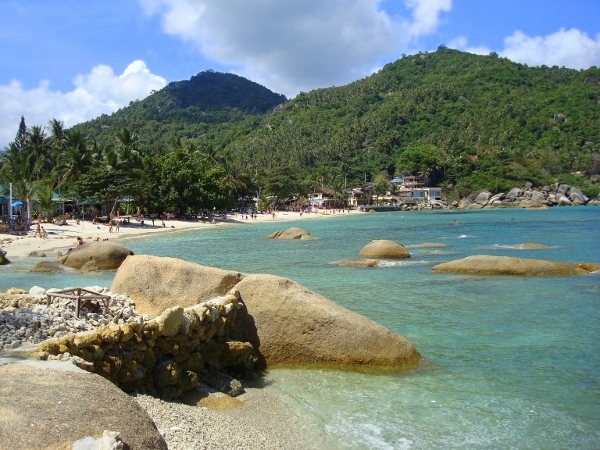 Located in the other direction on the island’s north shore, the stunning Maenam Beach lies to the west of Choeng Mon, about a ½ hour drive until you reach the busy town of Maenam. With predominantly low budget beach bungalows (though also offering higher end 5 star resorts), this is another popular part of the island for tourists, and is known as Samui’s last predominantly backpacker beach. The beach runs for 7 kilometers, and is favored among windsurfers due to the currents and winds which pick up on the north side. Though for this reason too, the waters are not as clear here as other beaches along the coast. The Moonrakers Beachfront Villas is ideally positioned in peaceful surrounds in Mae Nam, a short car trip from Chaweng Noi Beach and Wat Phra Yai. The hotel is set on Maenam Beach. Anjali is situated in Mae Nam and features complimentary wireless internet. The hotel is located on Maenam Beach. Located in Mae Nam, Amarin Samui Hotel is an easy drive from Bo Phut and provides free Wi-Fi and a rooftop pool. It offers 3-star accommodation with air-conditioned rooms. If you are visiting the island, do make a note to also visit Anthong Marine National Park. One of Samui’s most famous surrounding attractions, the park is also lined with spectacular and remote beaches, these more off the beaten path. Dotted with 42 beautiful tiny islands, there are many day trip opportunities from the park. It offers spectacular scenery and beautiful swimming in the crystal clears waters of the Gulf of Thailand. Having touched on only 5 of the islands beaches that we visited during our brief stay, that’s not to say that Samui isn’t bursting with more coastline to explore. If you’d like to search for Koh Samui hotels at the lowest prices, enter your dates below and click search. Booking.com will find the best hotel deals, and you can book your stay directly with them. Featured photo credit: Steve Jurvetson. Pinterest images by Sarah_Ackerman & Steve Jurvetson. I’m heading to Thailand in August. I was there about 8 years ago but only went down the Andaman coast, so I’m very excited to see Koh Samui. The photos make it look stunning! Ooooh you’ll LOVE it! Do make sure you carve out some time for Anthong Marine National Park – it won’t disappoint!! Safe travels! I spent a few hours in Koh Samui in transit from Bangkok to Koh Pha Ngan and these pictures have made me really regret not staying longer! I was on a tight schedule because I was rushing to the full moon party so that’s my excuse. Looks like I need to make a return trip to Thailand! I love this guide. 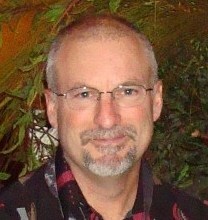 I first visited Koh Samui 20 years ago and loved it. Just a couple of months ago, I returned with my husband and kids and didn’t recognize the place. It was all grown up! I guess great places do that. We had a wonderful time there and hit a few of the beaches you mentioned. We also enjoyed having our ow private island picnic as well as a fab evening out with the Thai Experience. I do love Thailand. Glad you enjoyed the post Heidi!! It’s funny how places tend to grow up along with the times – I’ve had that happen to me a few different times on destinations I chose to re-visit after having been there as an early teen. Glad you enjoy Koh Samui so much that you’ve returned though – truly is a fab spot on the map! Private Island picnic sounds wonderful!! I spent two weeks on Ko Samui in the early 90s. It’s changed so much! I know I spent time on Chewang Beach, but the others, I’m not so sure. Really appreciate this comparison. If I go back, I’ll definitely suss some of these other ones out. Heidi mentioned the same above, about how much it had changed since she was first there. Hopefully in a good way! With a lot more tourism though I would guess without a doubt! Glad you enjoyed the post Jody – and I do hope you manage a trip back at some stage – let us know if you’re looking for any more additional comparisons on the beach! Thailand is on my bucket list and these beaches look amazing! Are they easy to get to? Is there parking? How about facilities like bathrooms and places to eat on the beach or do people bring a picnic? Sounds like a lot of people enjoy picnics, though the facilities will vary depending on the beach. 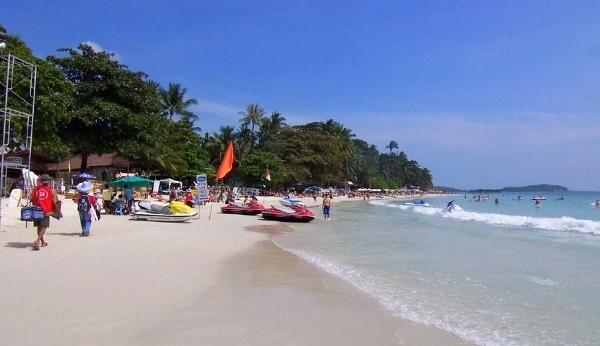 For instance the bigger resort.tourist beaches like Chaweng Beach you’ll find lined with recreation and facilities, and the town is built up around the beach so it’s an easy walk to find some food. Beaches – everyone’s idea of heaven, what more if they’re sandy and white. These beaches certainly come closest to one’s expectation of a heavenly break! Absolutely – white sand and crystal clear water is my perfect idea of paradise!! Take me there now! I’ve never been to Thailand but this post is definitely a motivator. My mom spent a bunch of time on Koh Samui a few years ago and regaled me with tales of Chewang and Lamai. Glad to hear they’re still amazing. I traveled 4 years ago to this place, I enjoyed it very much. Thank you for reminding me! Fantastic David! We’re happy to inspire a trip down memory lane :) Hope you have the chance to revist soon! I have been to Thongtakian Beach and it feels like home! Chaweng Beach is my fav. Right in the center of the action. What amazes me most about this place are the beaches with crystal waters… I feel like one day I can get to know this place. Reminds Me of the beaches of Brazil. Looking forward to go in these beaches. Now I can finally fill up my itinerary when I go to Koh Samui next month. 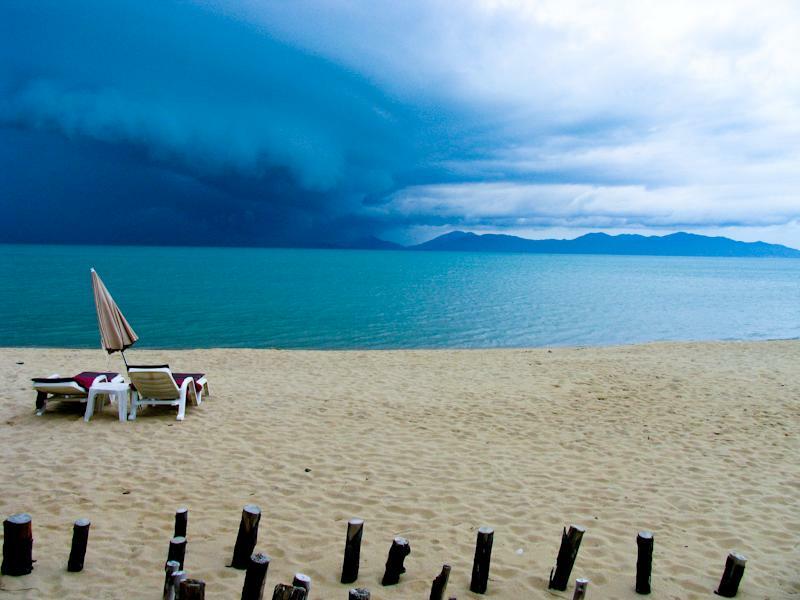 Glad the post was helpful in shaping your itinerary HL :) Have an amazing time in Koh Samui! I have a trip with my husband at Chaweng Beach last summer. So glad to hear you both enjoyed your time in Chaweng Beach Solhim. Water Skiing sounds like a lot of fun! Thanks John, glad you enjoyed the post. Thailand is amazing indeed! Hope you have the chance to experience it too! I think Lamai beach is the one I visited the last time I was in Thailand. It was definitely peaceful, something we were looking for specifically when planning the trip. What a great guide! These places all look like a dream come true to me. The photos are so amazing! Thanks Mary, I’m glad the guide was helpful for you :) Hope you have the chance to visit soon! Now that I’m not in school anymore, I really want to start traveling. Thank you so much for the amazing tips to save for the future! You’re welcome Hannah, Thailand is a great country to break into backpacking. Happy travels! I traveled to Lamai Beach a few years ago; the food was absolutely incredible and great views for miles! So glad you had a fabulous time Katie! Such a fab combination, great food, great views! 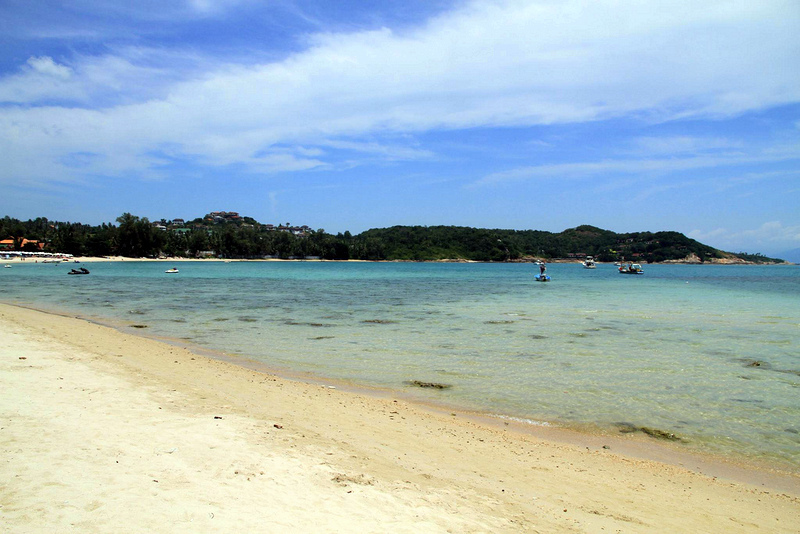 The most popular beaches in Koh Samui could not be more different from each other. In my opinion, Chaweng Beach is the best. It’s Koh Samui’s most popular stretch of powdery white sand. Totally agree, it’s nice that there’s so much choice and diversity :) Definitely can’t go past Chaweng Beach though!